Find out what our experts have to say about Bajaj Pulsar RS 200! The Pulsar RS200 is Bajaj’s fully faired offering and also its fastest motorcycle yet. It isn’t just a straight-line missile as the adept chassis make the RS200 fun to ride around corners as well. It is loaded with features and also the first Bajaj bike to offer ABS as an optional extra. Bumblebee-inspired styling is a love-it-or-hate-it affair. The least priced variant is Bajaj Pulsar RS200 STD priced at Rs. 1,49,730 and the most priced variant is Bajaj Pulsar RS200 ABS priced at Rs. 1,62,826. Choose the Bajaj Pulsar RS 200 which fits the bill of you. Bajaj has designed sporty looking commuter bikes with their Pulsar range and started a cult culture among the Indian youth of racing these motorcycles. They branded this culture with their very own Pulsar Maniacs, a riding community meant exclusively for Pulsar owners. It was fueled further and made bigger by the exclusive Pulsar Festival of Speed as well as the Pulsar Fest. Keeping this race culture in mind Bajaj had launched the Pulsar RS200, flagship model for the Pulsar range and the fastest Pulsar available currently on sale. Coming across as the most powerful and feature packed Pulsar ever, it had won many hearts during its launch. With a unique Rear Wheel Lift-off Protection component now, it was also the first Pulsar bike to don an ABS feature as well. It was also the first Pulsar to flaunt its full-fairing and with a never-seen-before body styling which some may feel a bit overdone. Pulsar RS200 looks somewhat similar or (some even say inspired) from the italian electric superbike ‘Energica Ego’, but who inspired whom is still a matter of debate and speculation. With it competitors like the Yamaha R15 looking bland and the KTM RC200 pricing really high, the RS200 seemed liked a total ‘bang for your buck’ when it was launched. But now the sales have dipped, thanks to the new redesigned Yamaha R15 VER 3.0 which looks more attractive, Suzuki Gixxer SF, Yamaha Fazer 25, and their very own Dominar 400 which gives more value for money. Pulsar RS200 is currently available in two variants; the safer ABS variant is priced at Rs.1,38,387, while the Non-ABS variant retails at Rs.1,26,483 (both prices, Ex-showroom - New Delhi). 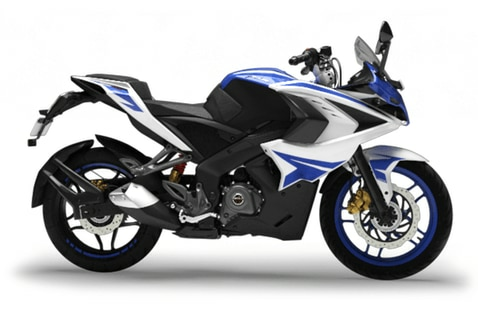 Looking at the new Pulsar RS200 you won't find any difference except for those in your face graphic stickers. A new Racing Red colour has been introduced for the year 2018, you still get the RS200 in old colour variants of Racing Blue and Graphite Black as well. Also, the front wheels on the Racing Red and Racing Blue color variants are finished in red and blue respectively. Gazing at the large number of angles, creases and vents, with a multitude of surface finishes, on the Bajaj Pulsar RS200 we feel the bike is slightly overdone in terms of design. Even the tail section looks quirky with those one of a kind tail lights. Halogen projector headlamps on the bike may not sound as good as the all LED headlamps on the R15 but work way better in dark or low light conditions. Pulsar RS200 has a comfortable seat which is lower and wider than its competitors as well as the much practical and usable pillion seat. The semi-digital instrument console though not as good as the all-digital one on the R15, but looks adequate with the readouts being clear and crisp. Engine on the Bajaj Pulsar RS200 is a KTM derived liquid-cooled, triple-spark, 4 valve, DTS-i single cylinder fuel injected 199.5cc motor and mated to a 6-speed gearbox. We would like to mention that this is only Pulsar that gets a Fuel Injection System, although NS200 with FI is available in other countries as well. Thought the Pulsar NS200 and the RS200 feature the same engine, it is tuned more on the latter to belt out a max power of 24.5PS at 9750rpm and a peak torque of 18.6Nm at 8000rpm. Now with a FI system and a tuned engine, the RS200 gives a better top end power output. BSIV updated the engine is now more refined and smoother than before. Fuel tank capacity is 13 litres, with a claimed mileage of 35kmpl and a max speed of 140.8 kmph. The bike offers a sporty power delivery with consistence acceleration across the rev range and due to the 4 valves the engine doesn't seem to be strained. Unlike the R15 and the RC200 which have a stiffer seat as well as an aggressive riding stance, the Pulsar RS200 is surprisingly comfortable. It is cause of this sporty but not too aggressive riding posture on this bike, you can ride for a long time without feeling any malaise. Perimeter frame mostly found on higher capacity sports bikes, provides ample rigidity while cornering the RS200. Even though the suspension setup is same as NS200 but a bit stiffer, it gives good rider feedback on those tight turns with those telescopic forks at the front with anti-friction bush and an adjustable rear Nitrox mono shock absorber with Canister. Tubeless tyres are identical to those of NS200 with 100/80 section at front and 130/70 ones on the rear, covering those 17-inch dual 5-spoke alloy wheels. Braking is governed by a 300mm petal disc at front and a 230mm petal disc at the rear. Like the NS200, the RS200 misses out on the kick-starter, but the electric starter works well. The optional single channel ABS is a boon for those riders who give safety the number one priority. ABS working with the new and unique Rear Wheel Lift-off Protection helps stabilize the bike and keep it grounded in those panicky braking situations while keeping the rider safe. AHO keeps the bike visible in any weather conditions on any time of the day.